One of my pantry staples for living a ketogenic lifestyle is Carbquik. 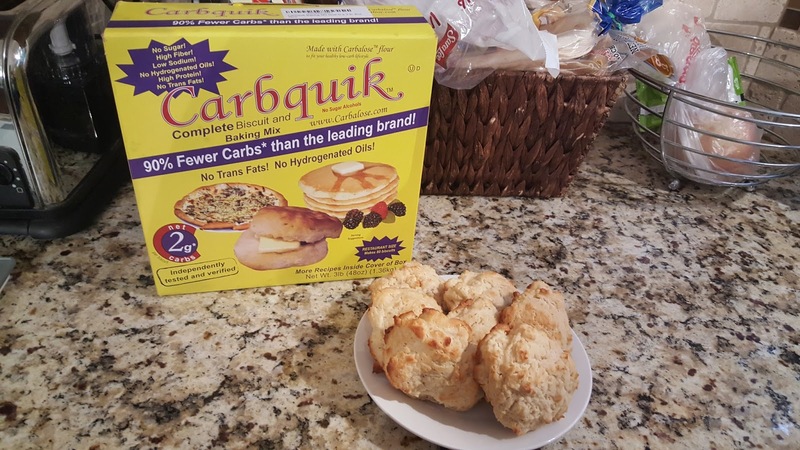 Carbquik is a low-carb version of the popular baking mix, Bisquik. I buy my Carbquik on Amazon for about $13 for a 3 lb. box which lasts quite awhile since I am the only one in the house who eats it. 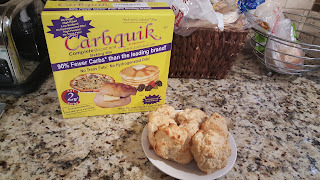 I typically use Carbquik for waffles or pancakes (with sugar free syrup) but lately I have been craving biscuits. My husband whipped up some Carbquik biscuits for me to go with our dinner of baked pork chops and french style green beans last Sunday evening. And yes, he is just that great of a guy to make dinner and make something that I can eat too. The biscuits turned out pretty good. They definitely are comparable to a Bisquik drop biscuit. They have some flakiness to them and crumble about the same. I think they would be great with sugar-free jelly or jam or to use in a breakfast sandwich with sausage and egg. They could also be modified to use as a shortcake for Strawberry Shortcake. I might have to try that next.